Since the 1970s, hundreds of tombs and thousands of ossuaries (limestone bone boxes) have been discovered in the Jerusalem area. These ossuaries served as coffins in first-century Jerusalem. One of these tombs was found to contain ten ossuaries. Six of the ossuaries in this tomb have inscriptions on them. As it turns out, every inscription in this particular tomb relates to the Gospels. In the feature documentary The Lost Tomb of Jesus a case is made that the 2,000-year-old “Tomb of the Ten Ossuaries” belonged to the family of Jesus of Nazareth. In other words, the “King of the World” has found the tomb of the King of Kings – Jesus of Nazareth, thus proving the resurrection never took place. Now that the invincible James Cameron has successfully destroyed Christianity he can get back to making inane anti-U.S. military films like Avatar. When I first watched The Lost Tomb of Jesus I was surprised at how naive viewers were in even considering the validity of the documentary. In response, I started to do my own research about the Talpiot Tomb, where the alleged bones of Jesus have been hidden for 2000 years just waiting for Cameron and his camera crew to come along and expose Christianity to be founded on a lie. The Lost Tomb of Jesus, a documentary recently aired on the Discovery Channel, claims an ancient tomb discovered in Jerusalem may have held the bones of Jesus. The project’s producer, James Cameron, commented that the implications of such a find could drastically change the sacred faith of Christianity. If Jesus’ bones really are among those found in the tomb’s ossuaries ¾ limestone bone boxes ¾ believers around the world have a major problem with their faith. His resurrection would be proven false, and Christians could no longer attest to the fact that they have been born again through the power of the Holy Spirit. As the apostle Paul said in I Corinthians 15:7: “And if Christ has not been raised, your faith is futile; you are still in your sins.” (Unless otherwise noted, all Scripture quotations are from the New International Version). TV host Ted Koppel interviewed several religious scholars immediately after the feature ended. He asked a priest on the panel, “What if Jesus’ bones are in the box?” The priest responded that it would not affect his faith. “My faith would go on,” he said. As I considered my own questions in the days that followed, a member of my church admitted to me, “Well, if Jesus’ bones are in the box, we have to close down this congregation.” This believer grasped the implications of the claims made by Cameron and his team. If Jesus had an ossuary, it would contradict the major tenet of the New Testament faith: that Jesus was resurrected and ascended to heaven. “For what I received I passed on to you as of first importance: that Christ died for our sins according to the Scriptures, that he was buried, that he was raised on the third day according to the Scriptures” (I Corinthians 15:3-4). “Praise be to the God and Father of our Lord Jesus Christ! In his great mercy he has given us new birth into a living hope through the resurrection of Jesus Christ from the dead” (I Peter 1:3). The New Testament is built on the veracity of the resurrection of Yeshua. It is neither an option nor a hypothesis; it is the bedrock of our beliefs. In answer to my own questions, if Jesus has not been raised from the dead, my life and faith are in ruins! Unfortunately, many spirit-filled and active believers have chosen to ignore the documentary, feeling they do not want to increase the ratings of the show or to lend credibility to the program. However, this attitude robs us of an opportunity to share the reliability of our faith with others. Since the show aired, I have encountered many secular individuals who watched the program and had serious questions about what it all means. After prayerfully pondering the Discovery Channel documentary, I wrote this brief booklet “Burying the Jesus Family Tomb Controversy” to equip my fellow Christians and interested seekers with a response to Cameron’s fictitious documentary . This booklet addresses the fallacy of Cameron’s documentary — and others like it — that dispute the life, death, and resurrection of Yeshua, our Lord Jesus the Messiah. I trust that my words will strengthen your faith, and give you the confidence to talk to any who may have questions about this controversial documentary. I want to give you a copy of this booklet – for free. All I ask is that you become a subscriber to the ScriptureSolutions blog and I will send you the booklet. For the first fifty people who sign up as subscribers to ScriptureSolutions, the booklet is yours. No strings attached. ScriptureSolutions is not a non-profit organization so I can’t even accept a donation even if you wanted to offer one. I’d rather you give the gift to your congregation. 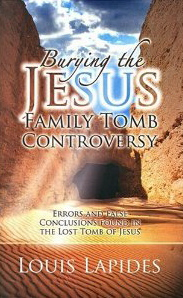 To receive your free copy of Burying the Jesus Family Tomb Controversy, please click here and subscribe to the blog. You can also go to the Subscribe Now widget on the left side of this page.